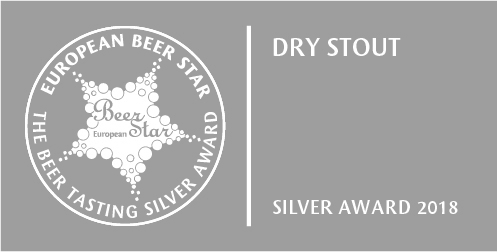 The Virginia Beer Company ended 2018 on a high note, receiving a European Beer Star Award for its Elbow Patches Oatmeal Stout recipe in the worldwide Dry Stout category! In mid-November, Virginia Beer Co. Co-Founder Chris Smith traveled to Nuremberg, Germany to attend BrauBeviale 2018 with 40,000 colleagues in the worldwide craft beer industry. BrauBeviale is the largest craft beverage exhibition in Europe and one of the largest in the world. Assistance from the Brewers Association's Export Development Program allowed Virginia Beer Co. to serve Elbow Patches Oatmeal Stout, Apricot Orchard Brett Golden Ale, and In The Moment Citra & Mosaic Wet-Hopped Double IPA to thirsty attendees at the Brewers Association booth on the trade show floor. The highlight of the trip was the presentation of the European Beer Star Awards, during which Elbow Patches Oatmeal Stout was awarded a Silver medal in the Dry Stout category! The competition was strong, with 2,344 total beers from 51 countries entered into 60 categories. Virginia Beer Co. will again be sharing its recipes overseas in late February as part of a delegation of breweries representing Virginia at the Craft Beer Rising festival in London (the second year in a row that Virginia Beer Co. has attended this international festival). "The recently released figures for 2013 show craft beer holding a volume share of 7.8% and a dollar share of 14.3%! 2,768 craft breweries contributed to the 18% volume growth and 20% dollar growth that occurred during the year. This growth is astounding when viewed from any angle." The preliminary 2014 data recently released by the Brewers Association proves that 2013 was no fluke. As of the end of 2014, craft beer now holds a volume share of 11% and a dollar share of 19.3%. That calculates to 18% volume growth and 22% dollar growth over the 2013 figures! The fact that the total beer market in the United States only grew 0.5% in 2014 makes the continued growth of craft beer even more impressive. A 19% increase in the number of operating craft breweries (from 2,863 to 3,418) resulted in production increasing from 15.6 million barrels in 2013 to 22.2 million barrels in 2014. Of those 3,418 craft breweries, 1,871 are considered microbreweries, 1,412 are brewpubs, and 135 are regional craft breweries. Total new openings during 2014 totaled 615, while only 46 previously operating craft breweries closed their doors. The Brewers Association typically releases finalized data following the Craft Brewers Conference (April 14-17 in Portland, Oregon). Data for individual states is also released at that time; Virginia's growth should mirror or even outpace what we are seeing on the national level. Check back next month for a look at those figures! The likelihood of reaching the Brewers Association's stated goal of 20% volume share by 2020 definitely increased with the success of craft beer in 2014! This has been a very patriotic week. Our good neighbors to the north celebrated Canada Day on July 1st. The US played in one heck of an elimination game in the World Cup. And today is July 4th, Independence Day. I love the 4th of July. It’s a time to reflect on the United States, its history and its freedoms. It’s a time to think of those who have served the country, as well as those who simply are and have been good, honest Americans. It’s a summer tradition that brings with it a well-deserved day off, a celebratory atmosphere, fireworks, cookouts, and of course, copious amounts of good beer. There are so many great ways to celebrate this holiday. And it's a perfect time to look at the craft beer industry as an analogy for the many freedoms we in the US have been granted since the Declaration of Independence was issued in 1776. The current booming state of craft beer is not what it has always been. As noted by the Brewers Association, there are close to 3,000 operating breweries in the US, the highest number since the late 1800’s. We’re talking about almost 150 years between those peaks! The craft beer industry is seeing a resurgence that means more choices for all of us. If you want a cold lager for your July 4th bbq, you can find one and it doesn’t have to be from one of the big boys. Maybe you want a session IPA, something hoppy but not overpowering? I’ve seen a few of those around. Perhaps a glass of something smooth as on nitro? Those options are starting to pop up all over. There are so many options that there is most certainly a style for everyone. People often ask us what kind of beer Virginia Beer Co. will specialize in. Our most frequent answer is that we are going to specialize in variety. I don’t want to make too much of that vague response, but I believe it’s the most patriotic answer we can give! We have the freedom to brew anything and everything, and we plan to. Mind you we have our year-round offerings well thought out, but with the taproom we are designing and the brewing systems we've purchased, we're going to have a lot of tap space for a lot of varieties. That brings up another great point about the current state of the brewing industry. Slowly but surely, legislation is moving in favor of small and craft brewers all over the country. Freedom, baby! Homebrewing is finally being formally legalized in pretty much every state. State laws are changing to allow more flexibility for breweries to get their product to the consumer. A great example is SB 604, which (to put it in beer drinkers’ terms) allows for production breweries in Virginia, like we will be, to serve draft beer on premise directly to the consumer, which we plan to. Historically with non-craft lobbying and pushback to the growing craft beer segment, getting this type of legislation passed was not always a sure thing. But across the country and throughout the States, the winds have shifted and we are realizing the positive impact that new businesses like ours can have on the surrounding areas. New jobs, new revenue streams, new sustainability options, and new craft products for all. Maybe it’s a stretch but these are the types of freedoms our forefathers would have loved. Clearly I’m the resident expert on these things, I live in Williamsburg (ie, Virginia’s colonial capital!). Freedom is what the 4th of July is all about. And right now we are seeing more and more freedom in the craft beer industry. Whether it’s more options for the homebrewer; more flexibility for craft brewers to operate in a manner that’s good for the business and good for the consumer (eg, fresh beer! ); or having the ability to offer beers of all shapes and sizes, it’s a great time to be in beer. And more importantly, it’s a great time to enjoy one! So whatever you do this Independence Day, be safe, be happy, and by all means be proud to be part of today’s celebration! God bless America and cheers to craft beer! Every year the Brewers Association asks member breweries to submit seminar ideas for the upcoming Craft Brewers Conference (see Robby's informative post about the conference here). In August 2013 we were beginning to plan our trip to Denver, Colorado, for CBC 2014 when the request for submissions arrived in our inbox. Having recently completed our business planning, we briefly considered the idea of submitting a proposal related to startup breweries. We felt like CBC veterans (having attended since San Diego 2012), but we were also keenly aware that we wouldn't be operational by the time the conference started. I've already waxed poetic in a previous post about the advantages of becoming members of the Brewers Association (or BA). Even before The Virginia Beer Company is up and pouring, we've learned a vast amount from our peers in the industry. I can say in earnest that our time as members of the BA up to this point hasn't been a boondoggle – the exposure to our future vendors and the networking opportunities have more than paid for the annual fee to be members. "How do you even go about starting a brewery?" This is one of the questions we are most frequently asked. It's something you don't really think about....until one day...and then it's all you think about. I feel like even in the early stages of dreaming of running a craft brewery, we still didn't get into the finer details of building the actual business until we finally asked ourselves that very question. There's actually more information out there than you'd expect (or at least more than I expected). There are a lot of biographical books about craft breweries that help to paint a picture of what you will be getting yourself into. The first book I read on the subject was Beer School by Steve Hindy & Tom Potter, the founders of the Brooklyn Brewery. It was an easy read and led me to many more books by similar-minded folks who opened great craft breweries, most of which are still thriving today (gives us hope!). There are also a lot of instructional and technical books out there. The Complete Joy of Homebrewing by Charlie Papazian is widely regarded as one of the go-to guides on homebrewing and Beer 101, so to speak. I also discovered Randy Mosher's Tasting Beer early in my self-instructional phase to help fill in the blanks about how to learn and talk about beer; and that book is now widely used as part of the curriculum for the educational beer program known as the Cicerone Certification so I must have been on the right track! Chris and I are both subscribers to BeerAdvocate magazine (partly because we want to do everything we can to make it on the cover at some point), which for a pittance per year (2-3 six packs, depending on your tastes) has some really interesting articles about beer, brewing, food, and everything in between.